Bootblack Brand was born out of a simple question asked by many a home bartender: how can I get the fancy cocktail experience at home without having a personal mixologist on retainer? Started at Hope and Main in Warren by Paul Kubiski and Jackie Duhamel last year, Bootblack is a line of artisanal, small-batch cocktail and soda syrups designed with simplicity and serious flavor in mind. “We try to create big flavor,” Kubiski says of Bootblack’s overall vision. That means bold flavor combinations in their syrups, like cranberry jalapeño lime and ginger cardamom lime,along with a classic citrus tonic. 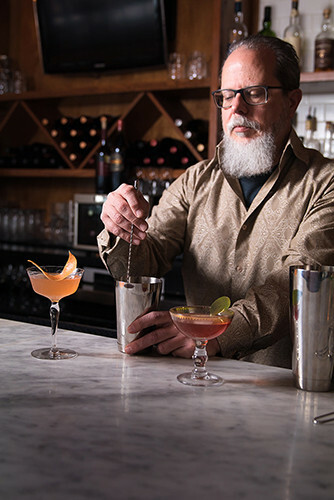 First they consider the flavors that “would make a well-balanced cocktail,” Kubiski says, and then leave it to the customer to construct the cocktail they’d like. Kubiski is usually a bit of a lone wolf when it comes to concocting new formulas, but recently he opted to crowdsource his creative process for the strongly spiced Old Fashioned syrup that launched in February, gathering input from a number of Providence bartenders. The finished syrup, influenced by both the traditionalists and the flavor chasers, is made with molasses, orange peel, black peppercorns, clove, cardamom, and coffee beans. Bootblack has grown by leaps and bounds since its founding and is now distributed in over 70 locations in Rhode Island – like Black Pear in Barrington, C&R Mercantile in Bristol, and Imagine in Warren – and Massachusetts. To accommodate that success and the demand that comes with that growth, Bootblack will be putting down roots in Pawtucket this spring. “It’s really going to allow us to scale without adding more cost,” says Kubiski. He and Duhamel are also in talks with distributors in hopes of expanding beyond New England. Shake everything except seltzer with ice. Pour into a highball glass filled with ice. Top with seltzer. Garnish with a wedge of grapefruit or lime. 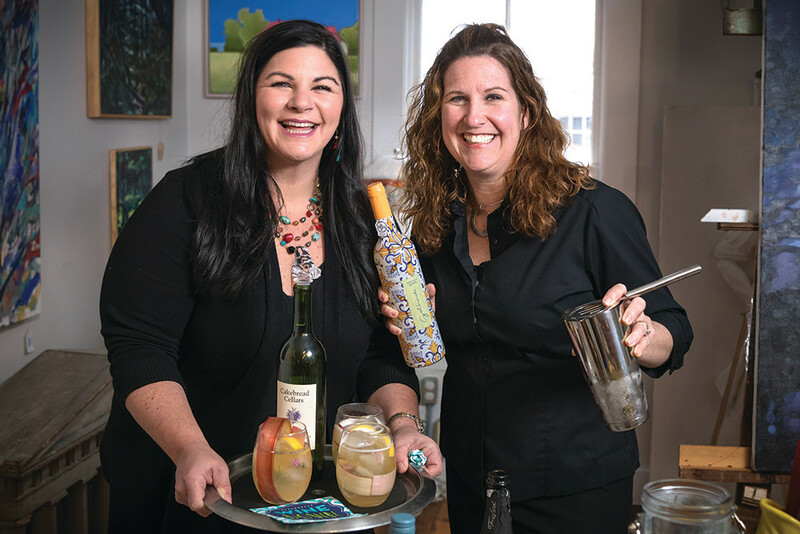 Michele Martins and Sandra Dugan, longtime pals and coworkers at the SS Dion Restaurant in Bristol, caught the bug for bartending at the Bodacious Bee, the Bristol-Warren Education Foundation’s annual fundraiser. Well-known caterer Lynne Turnbull of 195 Franklin was so impressed by their bar skills that she invited them to work for her in the summer of 2016. Two Gals Cocktails, a traveling bartending service named “over an evening of enjoying cocktails ourselves,” officially launched a year later. There’s no detail overlooked in a Two Gals presentation. Everything from the cocktails to barscape is thoughtfully considered, and that includes the bartenders themselves: they typically wear black on black, except when the occasion calls for some pizzazz. At last year’s Fourth of July Ball, they opted for red, white, and blue bowties. Catch Two Gals mixing cocktails on May 6, at Hope and Main for Community String Project’s fundraiser. Shake well. Top off with Cava Sparkling Wine and garnish with rhubarb ribbons. Bill Dessel had been tinkering with an idea for six months. The Barrington native and founder of Billy’s Restaurant had a concept for a low-calorie vodka when his college buddy, Tom McGowan, suggested an overarching concept: ”stay balanced” and the name KEEL – like the keel of a sailboat that keeps a boat centered and on track. 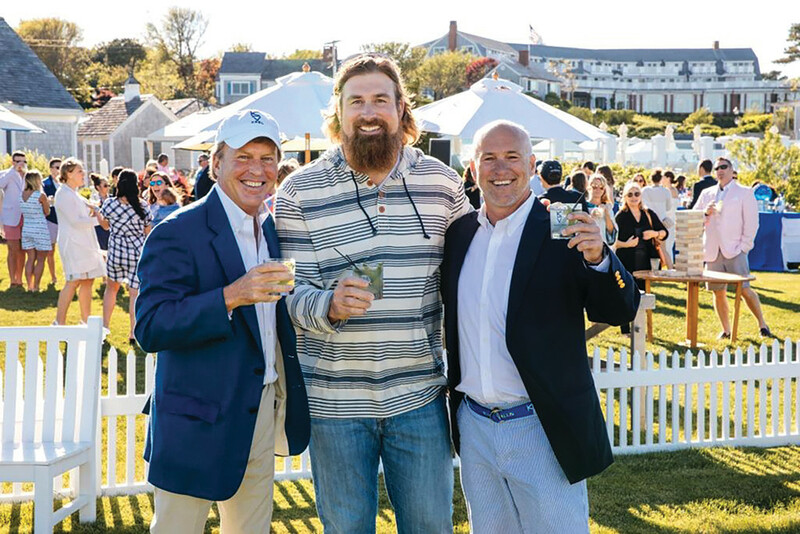 KEEL Vodka, a drink with a lower calorie and alcohol count designed to help you “stay at the party,” debuted in 2013, and has since picked up a well-known business partner: former New England Patriots offensive tackle Matt Light. This focus on active lifestyles and fitness is deeply connected to KEEL’s birthplace. “The East Bay is extremely health-conscious,” Dessel says, pointing out our always bustling bike path. The long-term goal? Take the concept and expand it to both tequila and gin.